NEW BRITAIN — Sitting in her corner office at City Hall Wednesday afternoon, Mayor Erin Stewart discussed moving forward with economic development plans, a more inclusive relationship with city aldermen and tackling issues such as the projected $23 million deficit for the 2013-14 fiscal year. 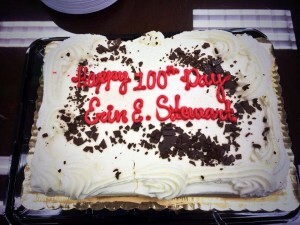 Today, the 26-year-old Republican mayor marks her 100th day in office. In a wide-ranging 45-minute interview, she touched on one of her toughest challenges — dealing with the injuries to city Police Officer Brett Morgan — to her greatest accomplishment and many other issues. Soon after she took office in November, Stewart said she found herself dealing with a budget deficit and a reorganization plan she said was confusing to many. Like many of her predecessors have done soon after they’ve taken office, Stewart instituted a hiring and spending freeze that remains in effect. Today, much of her time is spent deciding how to handle a deficit that was larger than many initially thought. She said all options, including layoffs and furloughs of city employees, are on the table. Stewart said she’d announce by early April what her specific plans on are to deal with the city’s financial woes. “If not the biggest obstacle, the deficit is clearly one of the biggest,” the mayor said. “I cleaned house (to address it). I hired a brand-new financial team. That includes a financial advisor, a new underwriter, a new bound counsel and, hopefully, a new auditing firm. The daughter of four-term Mayor Timothy T. Stewart, Stewart said she uses social media to connect with the public. “It allows me to reach a younger generation,” she said. The mayor has 2,000 followers on Facebook; 900 on Twitter; and 1,000 on Instagram. Clearly, the most emotional time for the mayor has been dealing with the aftermath of the injuries Morgan sustained when he was dragged by a vehicle driven by an alleged drug dealer.